Co-columnist Bob Bley lived in France for three years. He can tell you that most anyone who has visited France agrees, a very popular lunchtime meal in cafes and smaller eateries throughout the country is the Croque Monsieur. Another friend of this column, Fran Hancock, studied in Paris and remembers the Croque Monsieur served wrapped in string as if it is a gift. Very simply, the Croque Monsieur is a toasted ham and cheese sandwich that is one of the true staples of simple French cuisine. According to Wikipedia, The Croque Monsieur originated in French cafés and bars as a quick snack. The name is based on the verb croquer (“to bite, to crunch”) and the word monsieur (“mister”). The sandwich’s first recorded appearance on a Paris café menu was in 1910 and it’s still there today and will cost about six euros or just over seven dollars US. To adapt this sandwich for tailgating, we visited with nationally famous Chef Steven Oakley. He has a resume that is very long and respected. Here are a few highlights: For the past several years he has been a semifinalist for the James Beard Foundation’s “Best Chefs in America Award”. He won first place in the Food Network’s “Super Chefs Live” competition and he also defeated Bobby Flay on his Beat Bobby Flay show on the Food Network. 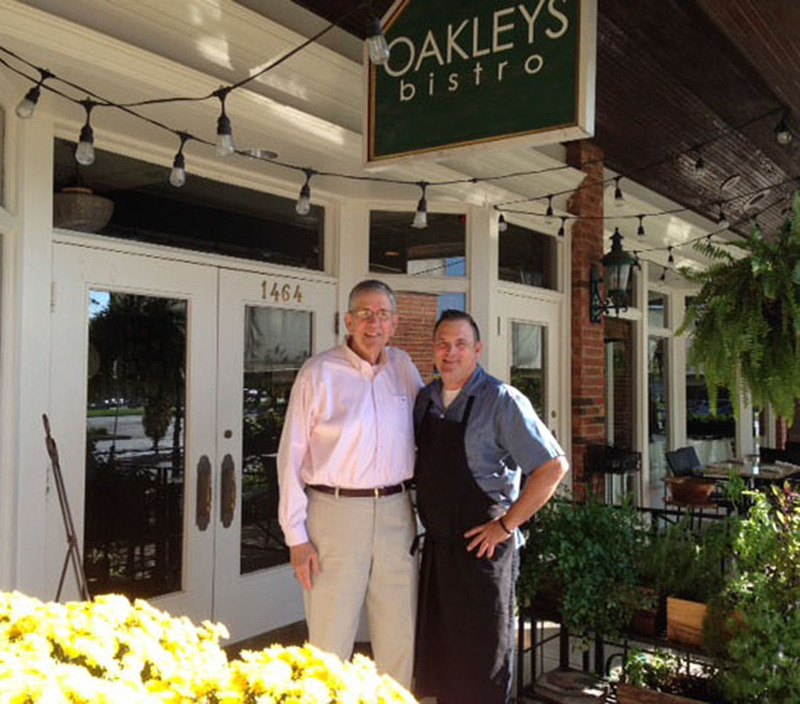 Bon Appetit Magazine has ranked his restaurant, Oakleys bistro (1464 W. 86thth street on the far north side of Indianapolis), as “one of the hottest restaurants coast to coast”. The list of his achievements goes on and on and is far too long for this column. We asked Chef Oakley about the Croque Monsieur and how to bring it to tailgating. Our dilemma was to be able to cook it in a parking lot without the usual oven and broiler. Together we figured that all a tailgater needed, besides the ingredients, was a skillet on their grill or flat top grill attachment and a lid or foil dome. Oakley said, “All you need to do is heat the ham and melt the cheese.” Here is our recipe and the directions for this great sandwich. The night before – To make the sauce (Mornay Sauce), use a sauce pan and melt 2 oz of room temperature butter at low heat. When the butter is melted, raise the heat slightly and stir in the flour and cook 3 to 5 minutes while stirring to make a rouge. Add the milk and bring up the heat to a slow boil while whisking constantly. Whisk until the mixture starts to thicken like a gravy. Whisk in 2 oz. of shredded gruyere cheese and then add the nutmeg. Remove the sauce from the heat and taste it. Add the amount of salt and pepper you feel it needs. Cool this sauce and refrigerate it overnight in a sealable container. To prepare the bread just toast it; then put it into the fridge in a sealable container or plastic bag. On game day – Pack your milk, ham, cheese, bread, Mornay Sauce and the remainder of the butter in your food cooler for travel to the stadium. At your tailgate first take the butter out of your cooler to warm-up. Began to heat/warm the Mornay Sauce in a separate small pan on the grill. You’ll probably need to add a little more milk to the sauce to thin it. Make the sandwiches by applying butter to the top of 8 slices of bread. Place four slices face down on your flat-top or pan and heat them as you assemble the sandwiches. For each slice add some gruyere cheese to cover the bread and one tablespoon of the sauce on top of that. Now add 2 slices of the ham on top of the sauce and then add a tablespoon of the sauce atop the ham. Finally add more gruyere atop the sauce. Cover with a buttered toasted slice of bread. With a spatula flip the sandwich over and add gruyere cheese atop the bread and cook with the grill lid down until all the cheese melts and blankets the sandwich. It will take up to 8 minutes at 350 degrees. Remove the sandwich to a cutting board and cut it in half. Present it on a plate with mini- pickles and some Dijon mustard for dipping. These proportions will make four sandwiches. If you are going to serve the sandwiches on a plate you can add extra cheese and us a knife and fork. If the sandwiches are to be hand-held than cut back on the cheese and allow them to cool a bit before serving.